Hours after my lunch in Macau, I'm back in Hong Kong catching up with a few friend over dinner at Ta Vie旅. I know that Sato-san has come up with a few new dishes for the season, and I was looking forward to trying them. 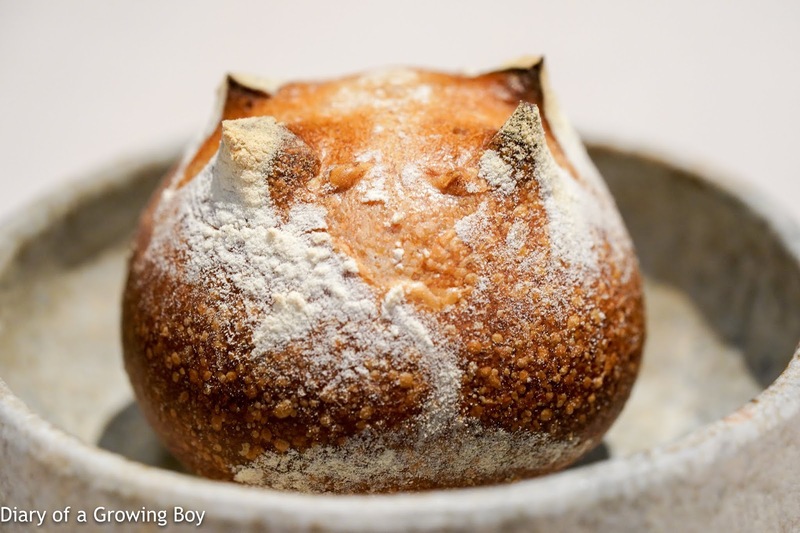 Nukazuke (糠漬け) bread - always happy to start the evening with this... warm and delicious. Kegani crab and avocado cocktail with black vinegar sauce, covered with chrysanthemum jelly - it's been a while since I last had this dish, which was inspired by Shanghainese hairy crabs. 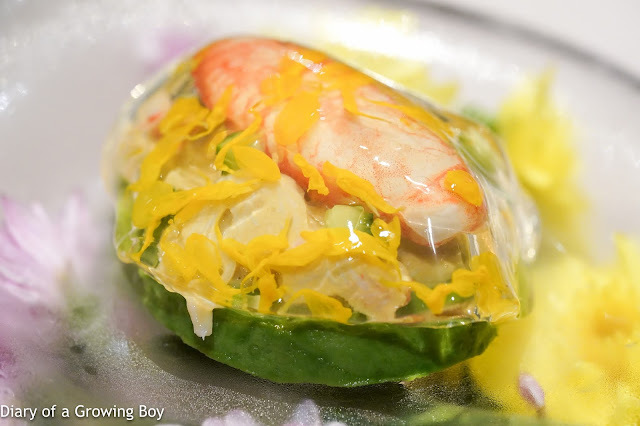 On top of the avocado at the bottom we've got diced cucumber, the leg of a Japanese horsehair crab (毛蟹) that has been seasoned with black vinegar, and covered with a layer of jelly with chrysanthemum petals - kinda like the Chinese chrysanthemum tea. Very refreshing and delicious. "Lung Guang" chicken consommé with wonton, matsutake mushroom and saffron mushroom - another dish that I haven't had in a while, and this made me very happy. 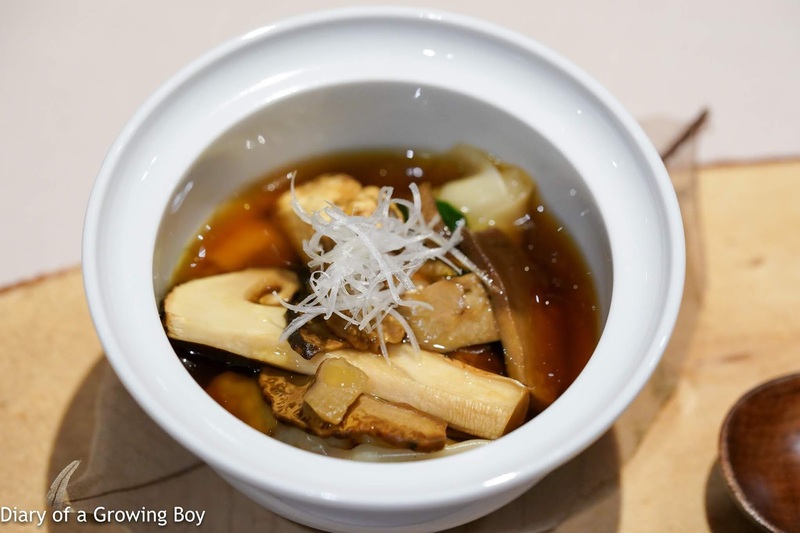 The beautiful consommé made with Lung Kong chicken (龍崗雞) came with wontons (雲吞) filled with minced chicken leg, plus some matsutake (松茸) mushrooms from Yunnan and saffron milk cap mushrooms. Just as it was with lunch, I found the matsutake to be fragrant and delicious, and the flavors were nicely infused into the consommé. The soup warmed my stomach, and I became relaxed and overcome with a sense of happiness. House made pasta with "aonori" seaweed sauce topped with "bafun" uni - of course, I am not privileged to have this dish on every single visit... which I never have cause to complain about! 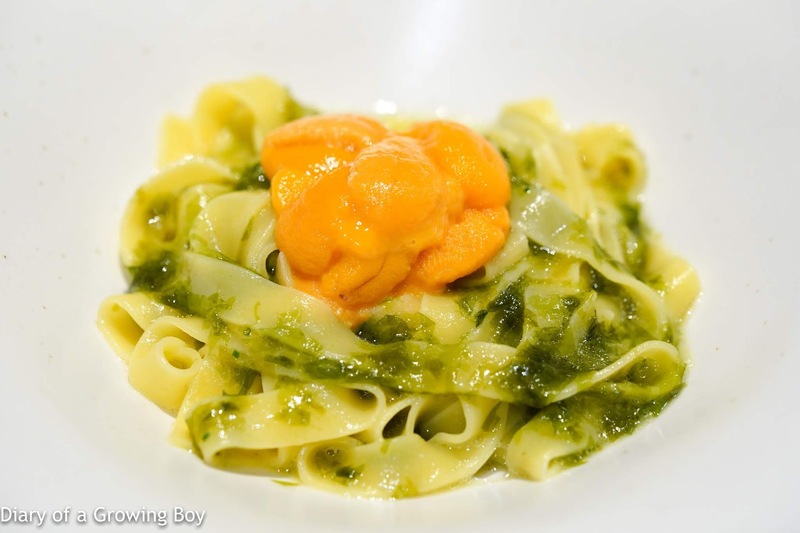 There is tons of umami here from the seaweed, which is balanced by the creamy, sweet sea urchin. I'm a happy camper! 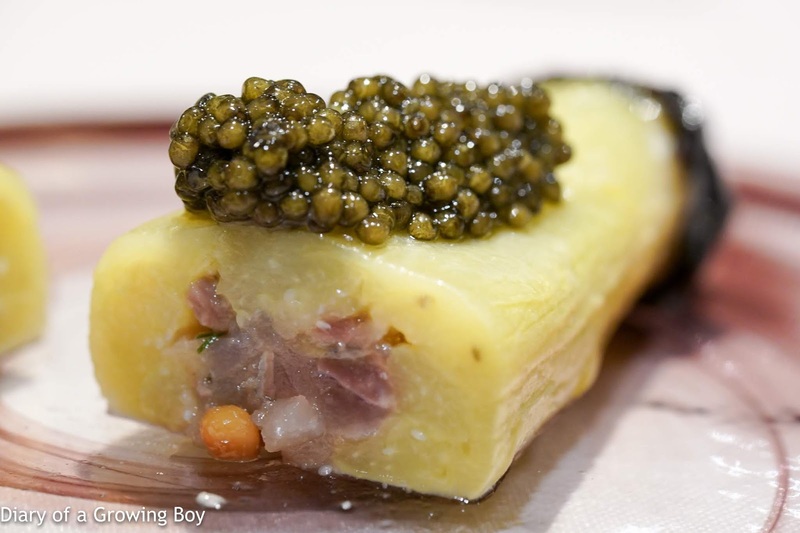 "Jade" eggplant marinated with ginger dressing, horse mackerel tartar with smoked oscietre caviar - the eggplant was marinated in a ginger and Sherry dressing, and came topped with a little smoked Kaviari oscietre caviar. 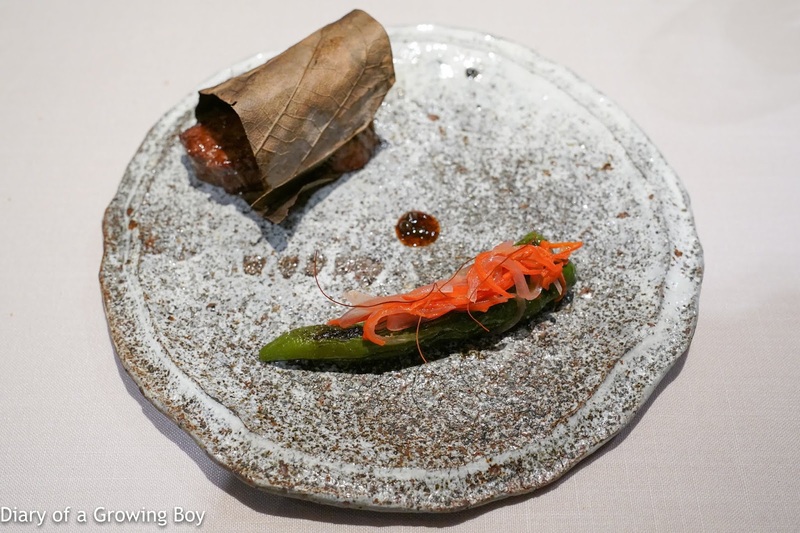 But the surprise came from within... as the eggplant was stuffed with smoked horse mackerel (鯵) tartare, along with diced orange capsicum, pine nuts, and crunchy tomato crackers which were almost like pork crackling. Very nice. 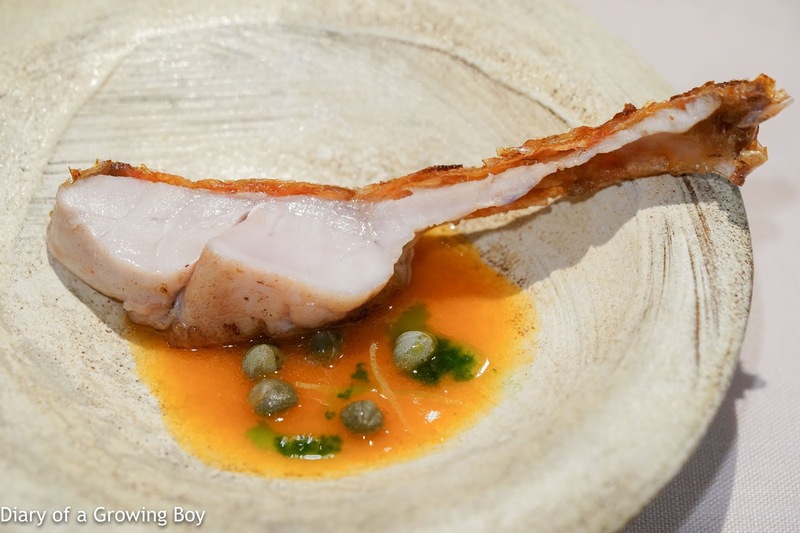 Pan seared "kinme-dai" with crispy scales, "acqua pazza" sauce - the splendid alfonsino came from Choshi (銚子) in Chiba Prefecture (千葉県), and of course it was fatty, tender, and delicious. The skin with scales was nice and crispy. There was some acqua pazza sauce in the bowl made from the fish head, fins, and bones. 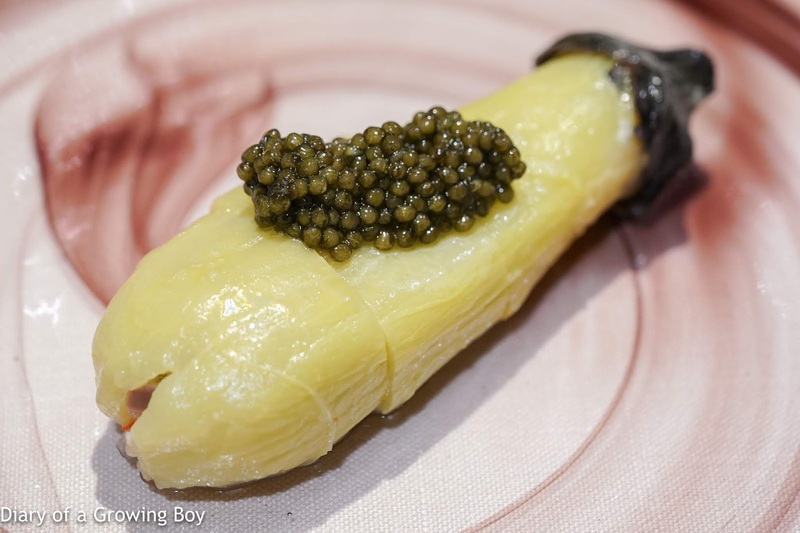 This came with a few pickled capers and some shavings of orange zest. 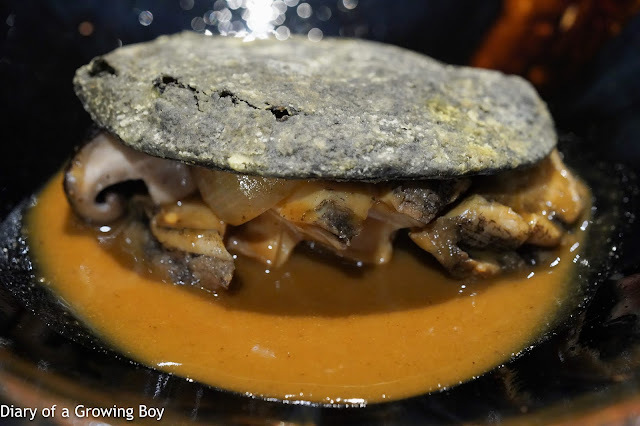 "Civet" braised abalone with abalone shell - I'm always happy to see this dish on the menu. Mushrooms, pearl onions, and tender abalone lathered with a rich and delicious sauce made with the abalone's liver. That puff pastry pretending to be the abalone's shell is nice, too. 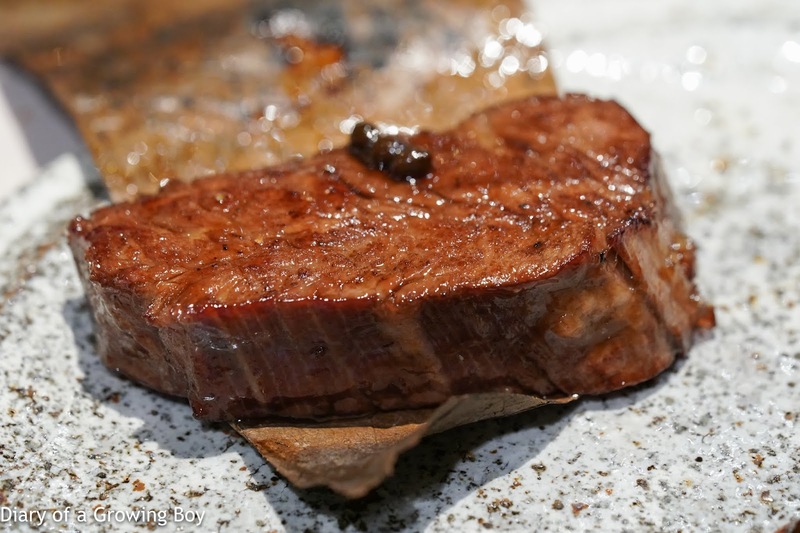 "Charcoal roasted" wagyu smoked with "hoba" leaf, glazed with Arima pepper sauce - a slight variation on an old dish. 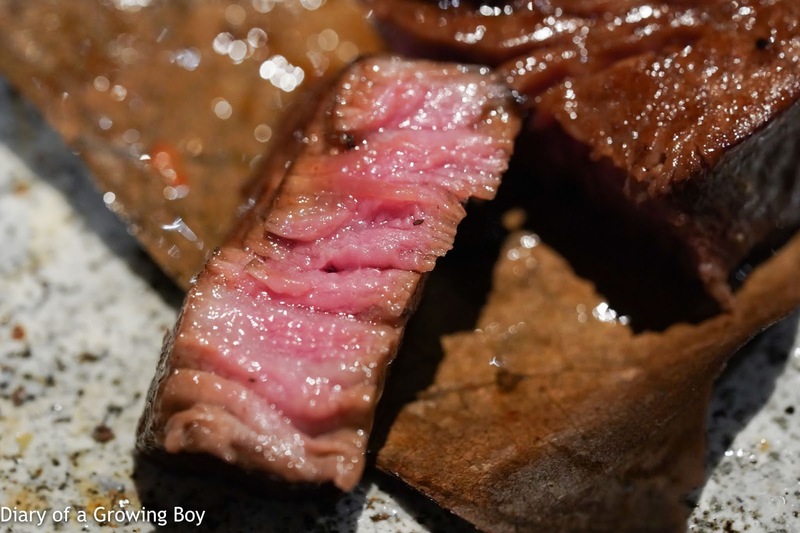 The beef from Kagoshima was smoked with the leaf of the Japanese bigleaf magnolia. The beef was relatively lean but tender nevertheless. Served with some marinated sansho (山椒) peppers from Arima (有馬). 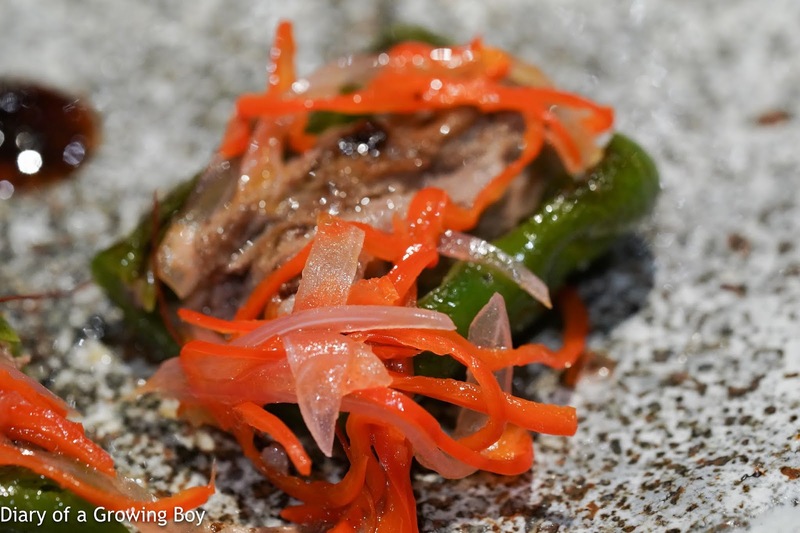 On the side we have a Manganji pepper (満願寺とうがらし) from Kyoto, stuffed with minced wagyu burger patty and topped with shredded red pepper and shallots. 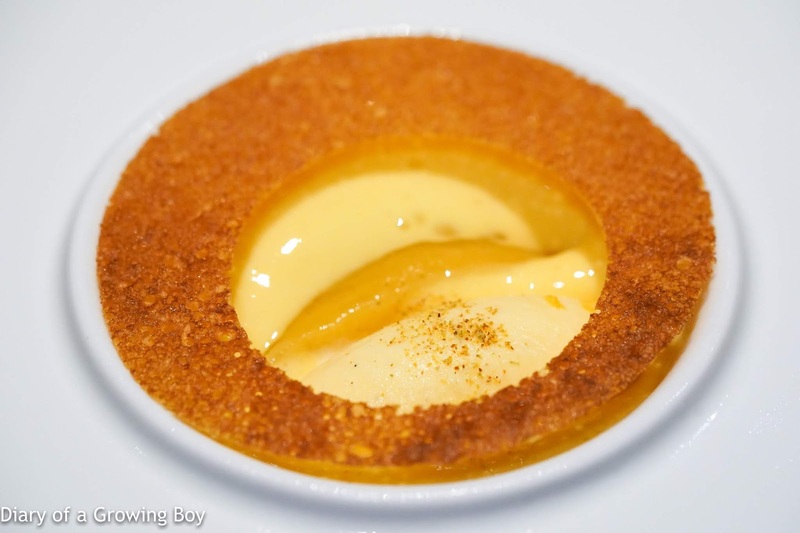 Golden peach compote with osmanthus sabayon sauce - the slices of Japanese golden peach (黄金桃) came with osmanthus flavored sabayon and vanilla ice cream, topped with a crispy crêpe. 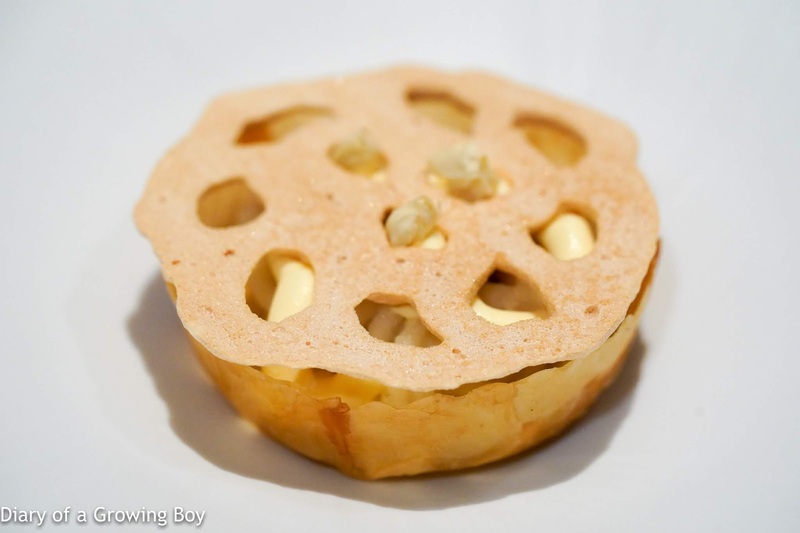 Lotus seed / jasmine / banana - my friend jokingly called this "Ta Vie mooncake" as the filo pastry contained lotus seed paste, jasmine flowers, and banana chunks. 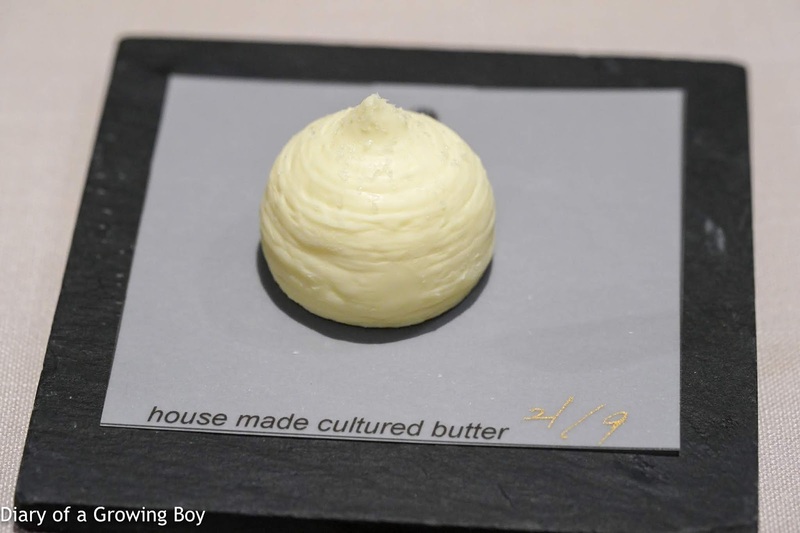 The pastry shell was made to resemble lotus seed pods. As usual we brought some vino to go with our dinner. 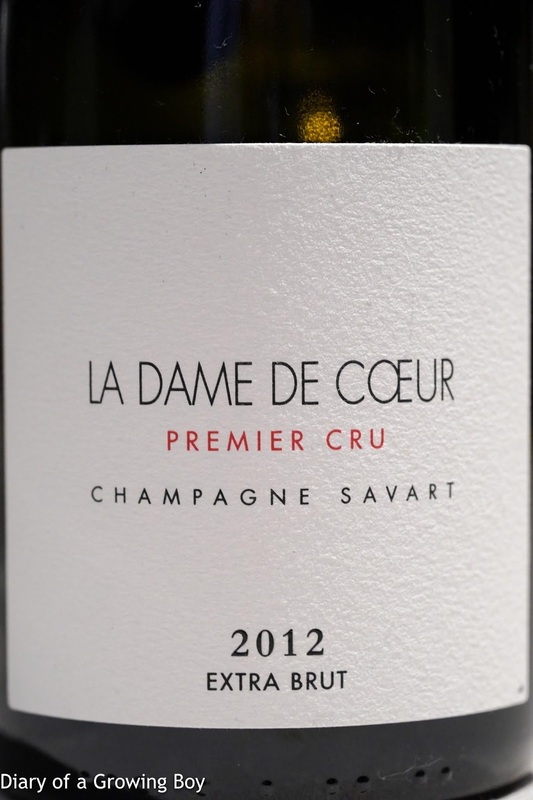 2012 Savart La Dame de Cœur, dégorgée en Mars 2016 - the nose was very distinctive if somewhat unfamiliar... almost like Chinese rice wine lees with a fermented, acidc nose. Pretty acidic on the palate, very full-bodied, big with a long finish. 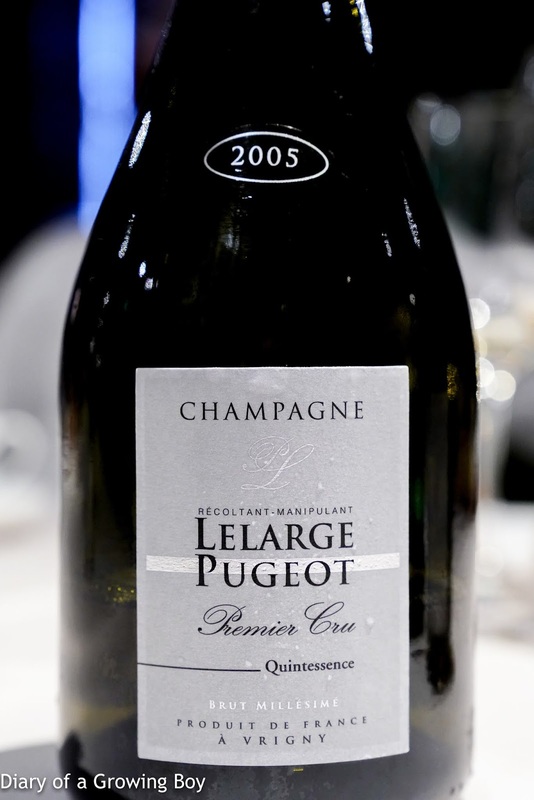 2005 Lelarge-Pugeot Quintessence - nice and smooth on the palate. Yeasty, a bit toasty. 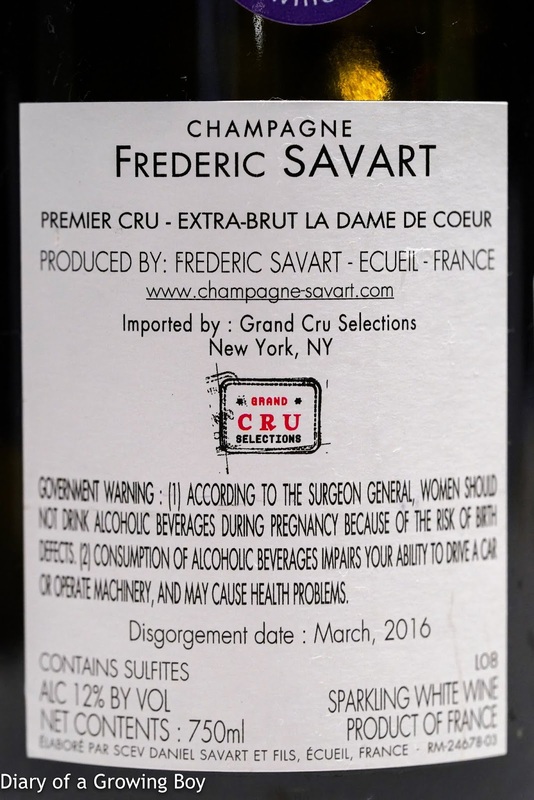 Good depth on the palate, and almost a little bitter. 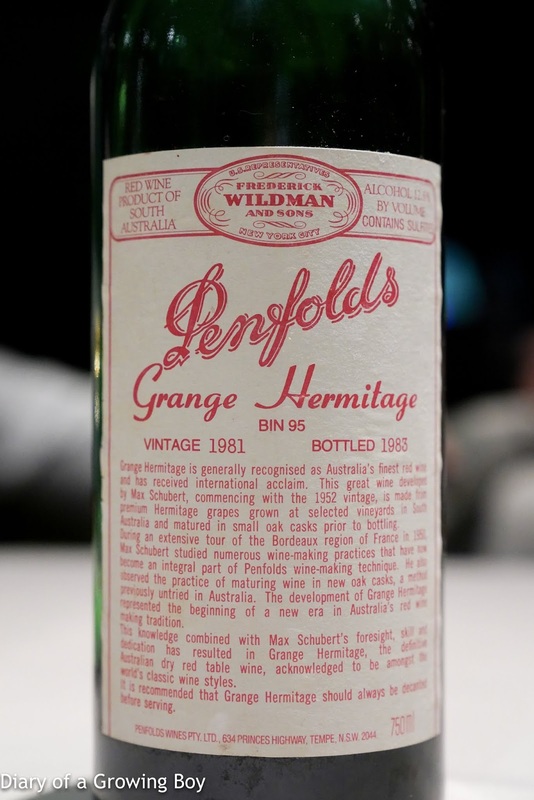 1981 Penfolds Grange - opened 1½ hours prior to decanting and serving. Nose of graphite, toasty oak, and coconut butter. Still got tannins but pretty smooth.